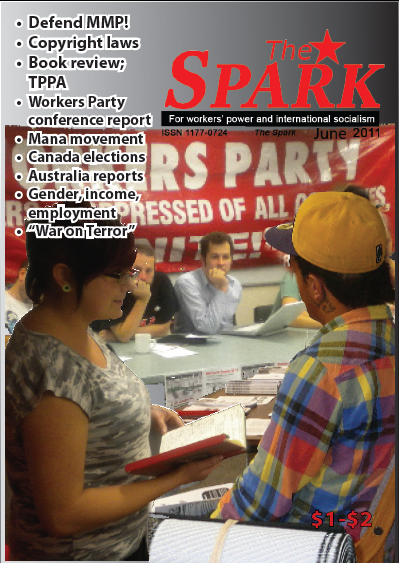 This month’s issue of The Spark was delayed because of the involvement of the production team in organising the Workers Power 2011 conference (see report on pages 10-11). There are two additional conference reports from WP members who attended the Resistance conference in Sydney and the Socialist Party Australia conference in Melbourne. This month we have an article on the recent Canada elections from Socialist Voice (Canada) co-editor Roger Annis. A few of us met Roger in 2008 when he came to check out Unite Union in Auckland and we are pleased we have been able to establish some ongoing communication with him. In this issue we include an article that he produced for Green Left Weekly but also with The Spark in mind (we solicited shortly after GLW). So it’s a good issue in terms of expressing living internationalism! In our own backyard we’ve got new copyright laws thrown down, secretive trade negotiations going on, an electoral system referendum coming up, and the emergence of a new party with a working class constituency. Please read on and please support The Spark.